A Review of Big Chicken by Maryn McKenna. National Geographic (September 12, 2017) 400 pages. People began cultivating plants and animals on a large scale about 10,000 years ago. Farming created a steady supply of nutrients, and acted as an insurance policy so that our ancestors weren’t constantly beholden to the whims of weather and the migration of animals. Of course, weather also affected crops, and farm animals sometimes escaped their pens or were killed by parasites. But settled agriculture allowed us to spread risk over longer periods of time and across more people. Agriculture brought with it enormous benefits, including a larger trading network, a greater division of labor, and even some genetic changes that we’re better off with than without. But it also exposed us to new risks, including a less diverse source of nutrients, and new pathogens (some of the genetic consequences of agriculture are a product of our new diet and new pathogens: those who didn’t adapt were culled by the invisible hand of natural selection). When we began to domesticate animals, we picked up the influenza virus from birds and pigs. Other microbes, including bacteria, also began to spread more easily between animals and the people who raised and ate them. Soon after Alexander Fleming discovered the antibiotic properties of penicillin, American famers found that adding antibiotics to chicken feed could speed up their growth. Maryn McKenna’s new book, Big Chicken, documents the causes and consequences of intensive animal farming in the United States, focusing especially on chicken. Big Chicken is a scientific detective story that uncovers why antibiotics were introduced in agriculture, and how this led to new strains of antibiotic-resistant pathogens that infect people. Unlike most journalists, McKenna is steeped in the scientific literature, and is a credible author on a topic most journalists barely cover, perhaps because they don’t understand the relevant science. American farmers started experimenting with antibiotics in agriculture in the 1940s, and found that adding them in small quantities could speed up the growth and increase the size of chickens. 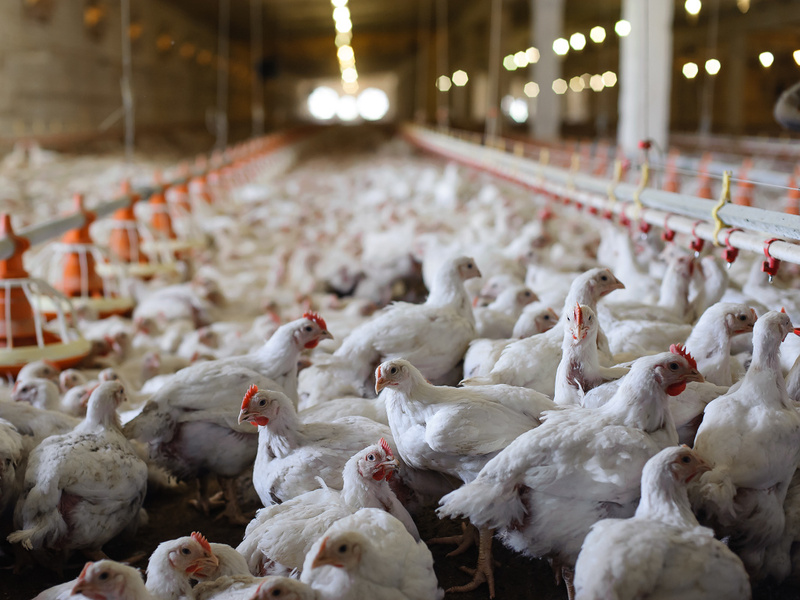 The mechanism was unclear, though scientists speculated that antibiotics increased nutrient absorption by reducing parasite load or by compensating for the stressful and dirty conditions chickens were often kept in when they were crowded together in coops. Most farmers didn’t know much about the science of antibiotic resistance, and many were quite happy to see their costs go down. But McKenna suggests that as early as the 1970s scientists worried about how the rise of antibiotic resistance on farms would affect people. After all, bacteria are everywhere, and the mechanisms they evolve to resist antibiotics can be spread between bacteria of all kinds. If a bacterium evolves penicillin-resistance on a farm, it can easily find its way into the meat supply, or the more general microbial environment. More importantly, the genes that confer antibiotic resistance can be transferred between different species of bacteria. It was not until the 1980s, McKenna argues, that scientists could trace specific strains of resistant bacteria to farms. By then, though, inertia at the FDA and lobbying power wielded by increasingly wealthy agricultural interests made it nearly impossible to regulate antibiotics in agriculture in the US. While it took scientists a few decades to clearly establish the link between antibiotics in animals and antibiotic-resistant infections in people, Alexander Fleming made it clear in the 1940s that “the thoughtless person playing with penicillin is morally responsible for the death of the man who finally succumbs to infection with the penicillin-resistant organism.” One form of “playing with penicillin” is the use of antibiotics as a growth promoter on factory farms. By the late 1990s European countries were beginning to regulate antibiotics in agriculture. In the US, meanwhile, scientists traced an antibiotic-resistant form of e coli that caused urinary tract infections in women to chicken farms in the Midwest. Yet the findings received little attention, and by the turn of the century antibiotic use in agriculture was growing explosively, especially in developing countries like China. In 2011, scientists discovered a strain of bacteria in Chinese pigs that could resist colistin, an antibiotic of last resort. The MCR gene, which is easily transferred between bacteria, was soon found in Chinese patients, and has since spread to people around the world. What should be done to reduce this risk is controversial, but a review of the literature suggests that we should eliminate the use of growth promoters in agriculture, and perhaps tax antibiotics used for other purposes to incentivize more prudent use. An antibiotics pollution tax would create a funding source to encourage the discovery of new vaccines, better diagnostics, and new kinds of treatments of bacterial infections for animals and people. One shortcoming of Maryn McKenna’s book is that she occasionally suggests that if we could just go back to small backyard farms, we’d all be better off. Rather than looking to future practices or alternatives to traditional farming like in vitro meat, McKenna extols the virtues of boutique farm operations in the hills of France, where hens are coddled and antibiotics are shunned. While we clearly need to move away from antibiotics and toward more humane practices, the scale of these operations and the price of the chickens they produce probably cannot be extended beyond a niche market. Moreover, the size of an operation is not always a good indicator of how humane its practices are, or how good they are for public health. For example, researchers have found no clear connection between the size of the farm and the extent to which animals are treated in a humane way. While this is a worthy set of goals, sometimes there are real tradeoffs: reducing antibiotics in agriculture will almost certainly involve costs, if nothing else by forcing farmers to switch to new methods of raising their animals. While McKenna nicely describes some of the methods that might be adopted – including better sanitation, a focus on vaccines rather than antibiotics, and more roaming space for animals – she doesn’t give quite enough attention to the costs that switching to new techniques will impose on consumers. Switching to antibiotic-free chicken, as many US producers are now doing, is not very expensive. But for other animals like pigs this switch will likely be costly. Of course, these costs are justifiable given that consumers of factory farmed meat are currently externalizing health costs onto others, and are consuming meat from pigs that are tortured rather than treated like sentient beings. Maryn McKenna’s book is science at its best: a compelling story that seeks to educate rather than manipulate readers. Big Chicken is an enjoyable read about two important topics: our uneasy relationship with microbes, and the dangers created when there is a disparity between what scientists know and what non-scientists believe. No mention of the use of animal breeding and now genomics to enhance productivity? There’s many reviews on chickens.